Labor Day 2018 will be celebrated on Monday, September 3 and that weekend in communities throughout Wisconsin. Labor Day parade and picnic at Lakeside Park. Parade lineup begins at 9:30 a.m.; begins at 11 a.m. at Rees and Main streets, traveling north on Main Street, past Scott Street. Picnic on Oven Island at Lakeside Park from 12 – 5 p.m. with live music. Food/refreshment proceeds will support local charities. Call 920-979-8303 for more information. Labor Day parade starts at 10 a.m. on Milwaukee Street in Menasha, continues to Main Street, turns onto Tayco Street, then to Commercial Street in Neenah and turns on Wisconsin Avenue. Parade ends at intersection of Church and Main streets. Activities continue from 11 a.m. to 3 p.m. at the Neenah Labor Temple, 157 S. Green Bay Road. Labor Day parade runs from 10:30-11:30 a.m. Volunteers should assemble at 9:30 a.m. at the Vernon County Highway Department shop. Laborfest activities to be held from Saturday, September 1 through Monday, September 3 at 1795 Lafayette St.: Music, rides, bike show, craft show, mud volleyball, and more. Labor Day parade begins at 1 p.m.
“Sturgeon Fest” runs from Friday, August 31 through Labor Day at Anson Park, 12848 Highway S: Demolition derby, truck pull, horse pull, crafts, food and live music. Parade on Sunday, September 2 begins at 12:00 p.m. Call 715-382-3970 for more information. Laborfest, 12 – 5 p.m. at 91st Street and 22nd Avenue, featuring booths from area labor organizations and activities for the family. 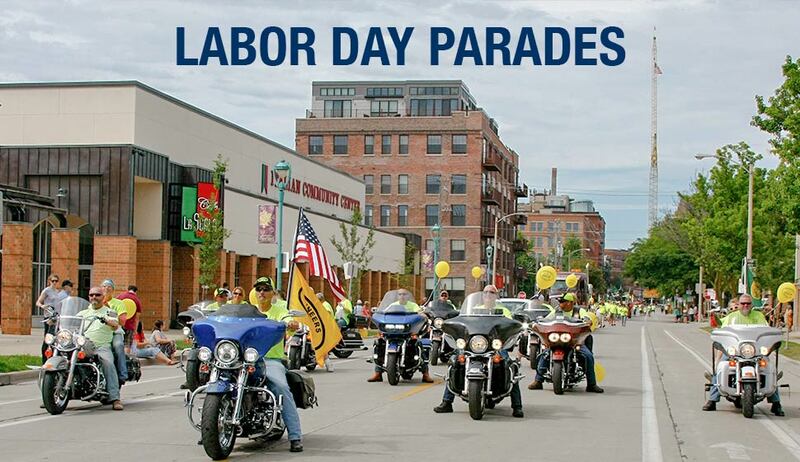 Labor Day parade begins at 10 a.m. with food, games and music to follow at Copeland Park, 1130 Copeland Park Drive. Call 608-386-0753 for more information. 12 – 5 p.m. picnic at Marinette City Park, 905 Madison Ave.
Labor Day parade starts at 10 a.m. at South Genesse Street and follows Main Street (Highway 64) to the courthouse. Call Business Agent Adam Kaseno, 800-851-7571, for more information. 11 a.m. parade starts at Zeidler Union Square Park and ends at the Summerfest grounds. Picnic and music will follow there until 5 p.m.
Laborfest, 12 – 4:30 p.m., Caledonia-Mt. Pleasant Memorial Park, 9416 Northwestern Ave., Franksville. 9 a.m. – 4 p.m. Labor Day, refreshment and food stand at Downtown Park; 9 a.m. parade lineup at village garage on Warren Street. Parade begins at 11 a.m., proceeding along Highway 21. Also at Downtown Park, 9 a.m. – 4 p.m., craft and vendor fair; 11 a.m., annual chicken barbeque; noon to 3 p.m., live music. Parade lineup begins at 11:30 a.m. Sunday, September 2 at the Shell Lake Arts Center, 802 First St. Parade begins at 12:30 p.m. Call Business Agent Casey Aronson, 800-851-7571, for more information. Labor Day parade lineup begins at 2 p.m. at North First Avenue and West Wausau Avenue. Parade starts at 4 p.m.